Coffee-making at Crafted by Te Aro (135 Ossington). With a Tim Hortons popping up in espresso-centric Little Italy and Starbucks sneaking its way into the Junction, neighbourhood coffee shops are in need of recognition just to stay in the brewing business. With that reality in mind, two coffee enthusiasts—who were previously uninvolved in the food industry and refer to themselves only as “Richard and Adrienne”—launched the Indie Coffee Passport this month. 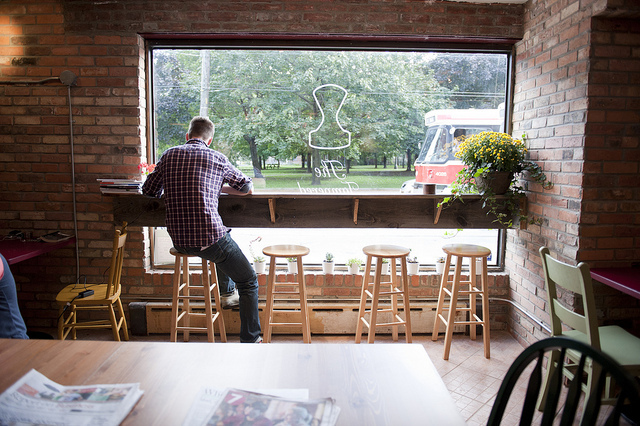 The venture’s designed to connect people to “Toronto’s fantastic independent coffee culture,” and for it, the founders approached every independent coffee shop they could think of south of Bloor. Twenty-four cafés signed up, adding their names to a card that lists coffee proprietors in a range of Toronto neighbourhoods—and that helps customers save some serious cash. Here’s how it works: coffee (or tea! or lemonade!) drinkers buy a passport either online or at any one of the twenty-four locations for $20 (prices go up to $25 on October 1, so act fast). That card entitles the customer to one free beverage of their choice at each establishment. The passport’s goal—to have the customer visit all twenty-four different shops—lets the passport holder try up to $120 worth of coffee while experiencing the different establishments and their various ‘hoods. While a few of the names on the passport are recognizable institutions that have been established for some time (Manic Coffee, Moonbeam Coffee Company, both locations of i deal coffee), the card also includes newer and less established businesses. 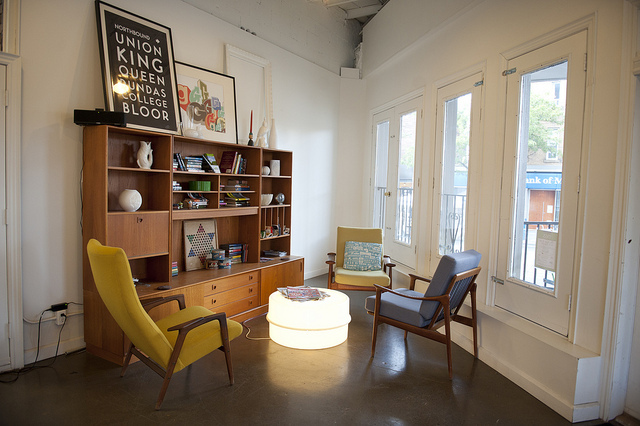 Top: The TAMPERed PRESS (256 Crawford). 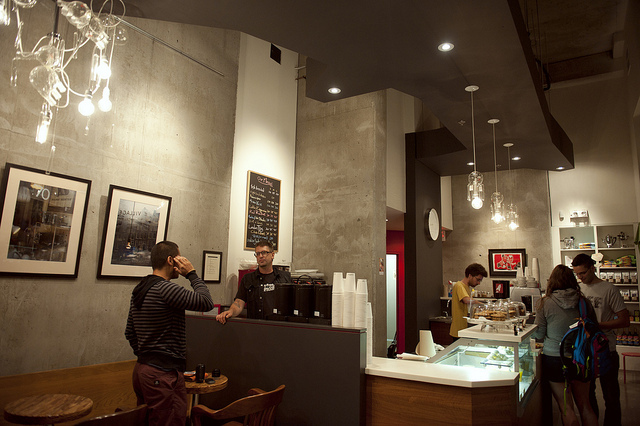 Bottom: Red Rocket Coffee (159 Wellesley Street East). A good place for a non-coffee geek to launch the passport is Te Aro Roasted, which has two locations on the card: Crafted by Te Aro Roasted on Ossington and the main café in Leslieville. Te Aro Roasted’s DIY ethos translates into them roasting all their own beans, and they’re famous in the coffee scene for having the largest air roaster in Ontario. Crafted manager Elena says that air roasting—which removes the burnt husk that gets included in drum or barrel roasting—creates a coffee without any bitterness or charred flavour. 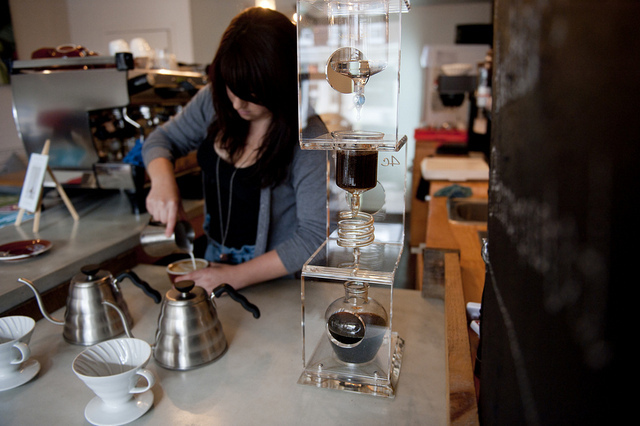 (Te Aro also uses manual methods of brewing coffee, such as using a siphon, which has been around since the 1830s.) One of the coolest contraptions on display at Crafted’s bar is the cold extraction apparatus, wherein three levels of glass funnels brew coffee as cold water is filtered into the grounds. The process, which takes about six hours, produces coffee that’s smoother and less acidic than one produced with hot water. If this all sounds a bit overwhelming, Te Aro holds free demonstration nights where patrons can learn about different methods of coffee creation. 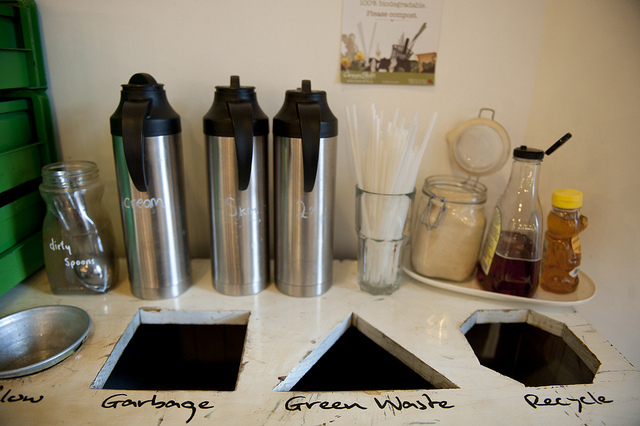 The super-environmental Green Grind (567 College Street). While not every café on the list is as interactive or detail-obsessed as Te Aro, the shared element of independent ownership makes for lovely atmospheres across the board. The five spots we visited with our passport all shared a relaxed pace, with baristas taking their time to craft drinks and chat with customers. Compared to the usually manic, impersonal nature of most Starbuckses, coffee drinkers lounged in the cafés, reading or working on laptops, with staff insisting that patrons are free to hang for as long as they want. 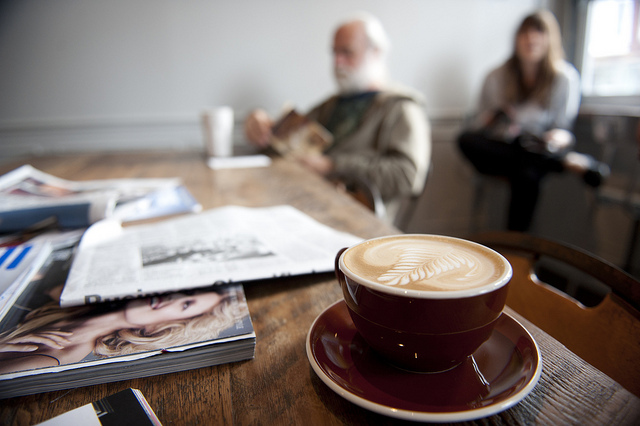 All five cafés had free Wi-Fi and provided a range of reading material, from newspapers to magazines to design books, with several shelving board games.